BPVC-XII-2015 covers requirements for construction and continued service of pressure vessels for the transportation of dangerous goods via highway, rail, air or water at pressures from full vacuum to 3,000 psig and volumes greater than 120 gallons. "Construction" is an all-inclusive term comprising materials, design, fabrication, examination, inspection, testing, certification, and over-pressure protection. "Continued service" is an all-inclusive term referring to inspection, testing, repair, alteration, and recertification of a transport tank that has been in service. 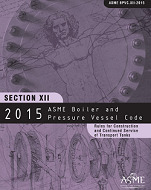 This section contains modal appendices containing requirements for vessels used in specific transport modes and service applications. Rules pertaining to the use of the T Code symbol stamp are included.